We had a big storm on Wednesday night so the USACE is running a full unit around the clock until Greers Ferry lake is back into the conservation pool. On Friday the river was a bit off color and high from both storm run-off and generation which made for tough fly fishing. 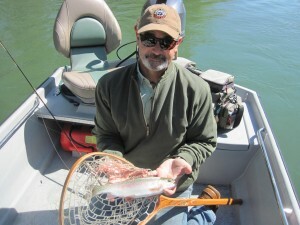 Nevertheless Rob and Jerry from Oklahoma hung in there and caught a few decent Rainbows. Streamers were the ticket along with #12 Chronic under a San Juan Worm. Sometimes even just an average fish is a prize when you do it in difficult conditions.